Cypress Dunes was about 75 miles west of the center of the eye of Hurricane Michael. The West End of 30a was very lucky - We never lost power and no damage to the house or the Cypress Dunes Community. At Glantz Gulf Beach Paradise we have a list of the best Happy Hours and early bird specials in the area. 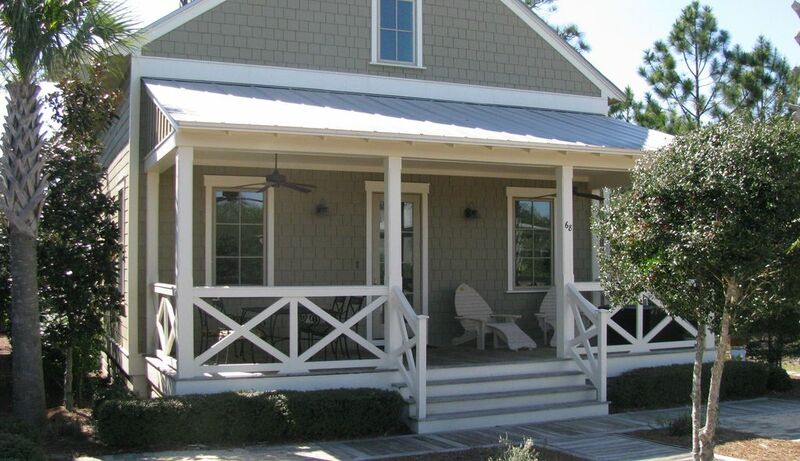 Cypress Dunes is a gated village of luxury beach cottages located at the beginning of scenic 30-A next to SanDestin. This friendly community is nestled between Topsail State Park/Nature Preserve and the beautiful white sandy beaches of the Gulf of Mexico. Topsail Hill Preserve State Park is known as the most pristine piece of coastal property in the state of Florida. The park is made of more than three miles of white-sand beaches, massive sand dunes (including the Topsail Hill dune, which towers 25 feet above sea level), lakes and indigenous flora and fauna. Visitors are invited to enjoy swimming, bicycling, roller blading, fishing, hiking, picnicking and more. You will love this beach cottage for the natural serenity outside as well as the comfortable and relaxing interior. This cottage will impress with its wood floors, high ceilings, elegant furnishings, and fully equipped gourmet kitchen. If you are looking for comfort, serenity and relaxation, then this cottage awaits you! Step onto a spacious front porch and enjoy the beauty and simplicity of the outdoors. Inside, you will delight in the inviting living area that is perfect for being with family and friends. The open living room is complete with comfortable, oversized seating and large flat screen HD TV. A fully equipped kitchen is open to the dining room that seats 8. Free WiFi internet access and free U.S. long distance calling on house phone. The first floor has two bed rooms, both with queen beds, flat-screen cable TVs, DVD players and private baths. Each bedroom opens out to the private screened in porch, perfect for morning coffee or cocktails at dusk. The second floor master is the perfect spot for mom and dad, with their own private bath, private porch and king bed, for total relaxation. Let this be your home away from home and retreat to this cottage for a vacation to remember! This cottage is located directly behind the cypress pond with its majestic cypress trees and varied wild life. The entire Cypress Dunes community is connected with walking paths and bridges making a walk to the beach club or the common green area a nature filled adventure. Two regulation championship tennis courts are located just across the street from the Glantz Gulf Beach Paradise house. We are pleased to announce that we now have a second home available for vacation rentals in beautiful Cypress Dunes subdivision! This recently built home is 3,200 sq.ft., 3 levels, 4 bedrooms, 4 1/2 baths, an outdoor shower, 2 car garage and an elevator! It easily sleeps 8 people. The Cypress Dunes community offers a long list of amenities in a quiet and peaceful surrounding. The upscale amenities include a beach club which showcases a gulf front Infinity edge pool, state-of-the- art fitness center, outdoor jacuzzi and fireplace, observation sun deck with incredible views of the Gulf of Mexico, and a banquet room just waiting to host your special event. Two regulation championship tennis courts are located just across the street from the Glantz Gulf Beach Paradise house. Nature trails for relaxing walks meander throughout. You can always walk to the beach which is about a twelve minute walk or five minute bike ride. Getting to the silver sands gulf beaches - access is about a 12 minute walk or a 5 minute bicycle ride, or a real quick drive to public, free parking area with public bathrooms and showers and life guards on duty March thru September. As part of your stay, it is worthwhile to visit each of the beaches along Scenic Route 30A where public access is readily available. These are great beaches for people watching and admiring the many gorgeous beach homes along the shore. Cypress Dunes and its surroundings are ideal to explore on a bike. Miles of paved trails at the beaches of South Walton are ideal for biking during your visit to Cypress Dunes. Both beginner and advanced cyclists enjoy the 18.6-mile scenic 30-A bike trail that winds through the area’s coastal dune lakes and villages. You can rent a bike at several of the nearby bike shops in the area. You can call them and they will deliver the bikes to the cottage. See our personally prepared directory of the area's unique restaurants, bars, activities, shops and professional services for more information. All rental fees will be returned if reservation is cancelled prior to 30 days of arrival date. Any cancellation of less than 30 days will result in forfeiture of your paid deposit unless we are able to re-rent the unit. In the event we do not re-rent the unit, we will gladly apply your deposit to a future reservation with us. Cancellations of less than 14 days are completely non-refundable. Cypress Dunes has two full size tennis courts across the street from our house. Amazing beach home in an amazing location. Avoid the hustle of Destin and still have close proximity to beaches (<2 minute drive) with easy parking and a beautiful pool, workout center, and lounge on site. The setting is gorgeous and the walking trails and tennis courts are superb. We will DEFINITELY be back and choose the same location for years to come. Glantz beach house is spectacular! You won’t be sorry to stay there! Beautiful, clean, looks like a brand new house. Close walk to the Gulf. House was comfortable, clean and just what we needed. Our family had a wonderful time. Nice house. Comfortable and well kept. Really enjoyed the pool area of the subdivision. HWY. 30A: REST & RELAXATION AT ITS BEST!! My wife and I came to Destin to spend 2 weeks alone for the first time in 26 years. We arrived in Destin on Labor Day weekend on Saturday afternoon. Our original rental was a wore out, unclean disaster through Beach Escapes Realty in Caribe. They were not willing to help us with other accommodations, so we sat on the front porch scouring the internet for a new location at 4pm. My wife found a location she liked, I called Home and Away but since it was to late to book for Saturday night, the only way we could contact the owner was by email. In no way did I expect to get a response that late, but Andy personally called me back in 20 minutes!! He must have heard the desperation in my wife's voice, as they assisted us in finding a place to stay for the night and had their rental ready for us the next morning!! After renting homes in Destin area for the last 25 years, I will share a valuable piece of advice: try and avoid renting through a realty company who manages the house for the owner; instead try and deal directly with an owner who "takes pride" in "their" personal investment. Most owners using realty companies to manage the rentals will NEVER be as attentive as Andy and Michele Glantz. We had never stayed on 30A and even though the neighborhood has no access to the beach, you have public accesses within minutes. If you liked to walk, run or bike: the paved path outside the neighborhood will give you unrestricted access to exercise! We spent most of our time at the beach but if it's pool time you enjoy, Cypress Dunes Infiniti Pool is one of the nicest we've ever seen. The view is one of the most unique in the area, with views of the Gulf and a huge forest of evergreens to the West. The workout room is outfitted with excellent equipment and space! If you like to avoid traffic noise and the hustle and bustle of Hwy. 98/Old 98, Cypress Dunes is gated and quiet. The Glantz house allowed us to relax and enjoy our entire stay. Everything was very comfortable, Andy quickly responds if you have any questions about things to do. They also provide a folder narrowing down your choices of good food! Andy led me straight to some of the best gumbo in the area! We absolutely love the place. This is our third year and it is such a beautiful place. The house is beautiful and the surrounding community is great. We would recommend this to anyone. Thanks again for allowing us to stay at your place. Scenic 30-A boasts some of the finest chefs in the country and this stretch of beach is known for their restaurants (Check out our persnally prepared directory for more information on the area), This area also is known for their arts, wine and food festivals, If it's beautiful beaches you are looking, look no further, Approx, 40% of South Walton Beaches are owned by the State of Florida and are protected from further development, The White Sands of this Area have been noted as the Best Beaches in the U, S, Don't Miss Out!, Shopping in South Walton ranges from the Designer Outlet Shops to quaint, eclectic boutiques that are dotted all along the Beaches of South Walton, Among these is a tremendous amount of art galleries, antique stores and gift shops, Nightlife in Santa Rosa, is just a skip away where you can dance until 2 am at Salty Dogs or the clubs in the Village at Baytowne Wharf in Sandestin or cruise down to Seaside to visit the famous Bud & Alley's Rooftop bar.